My Hidden Folders 2008: Instantly hide your files -- even from Administrators! Today is Sunday, April 21, 2019. Your local time is 02:23pm. My Hidden Folders 2008 - Instantly hide your files and folders! A lot of advanced users believe that My Hidden Folders (as well as any other third party folder protection software) is useless because Windows has integrated file and folder lock features. Windows allows you to lock files and folders on NTFS volumes only. FAT and FAT32 are not supported. Although nowadays it's too difficult to find a Hard Disk Drive (HDD) formatted with FAT, it's still in use in different removable storage devices. It is impossible to hide folder or file with standard Windows XP facilities. Only file and folder lock is possible. There is no way to make folder invisible but accessible which is helpful for different security tasks like logging, private data recording, backing up etc. 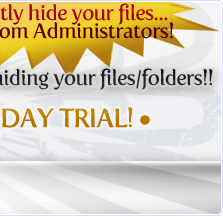 A system administrator can easily get access to the locked folders and files. Windows XP home edition doesn't have a user interface to protect files and folders. There is no files and folders password protection in Windows XP (except the password you provide during Windows logon) - as soon as an authorized user authenticate himself by logging on, s/he get access to the protected files and folders. If you share your account with the another users then you can't exploit Windows folder protection features.